I replaced two leaking crankshaft oil seals this winter. One was on a 2000 Dodge Caravan and the other a 2001 Daewoo Leganza. When these seals went, it was no little drip. It was more like a gusher. This post will cover removal and installation of the seal only. The seal is a metal ring with a rubber-like material bonded to the inside and outside edge. The outside edge of this type of seal is pressed into the bore of the engine around the crankshaft. The inside edge seats around the shaft. A spring in the seal pulls the seal into position around the moving shaft. Care must be taken during installation to ensure that this critical sealing surface is properly seated. 1) Use a punch to make an indent in the exact middle of an accessible part of the seal. This type of seal has no raised edge where a claw-type seal removal tool will fit. A spring loaded punch is best for this job, although if room allows, a hammer and solid punch will have to do. 2) With a small drill bit, 1/16th or 3/32, drill through the middle of the metal portion of the seal. Drill only through the seal, making no contact with the bore, the crankshaft or the inner face of the engine behind the seal. 3) Now start a small sheet metal screw in the hole. The bottom of the head needs to be flat, do not use a beveled screw designed for counter-sinking. 4) With a forked prying tool, get under the screw head and pry out the seal. It may help to put a small block of wood under the tool for leverage. If struggling here, try a larger screw. Just do not use a screw so large that it scratches either the bore or the shaft. It may take quite a bit of prying to get the seal to budge, but it will come. 1) Check the bore and shaft surfaces for any marring that may have occurred despite your best efforts during removal of the seal. A cue tip works well for this. If there is any marring, carefully remove with fine file and sandpaper. 2) Fashion a seal installation tool out of a piece of pipe. Measure the diameter of the outside of the seal and use a pipe with just under that dimension. I have found that 2 inch pvc tends to be about right. The length depends on the depth of the bore and the length of the shaft bolt. Take care that the pipe tool is as square as you can make it. 3) Apply automotive grease to both the shaft and bore. 4) Apply grease to the inside and outside mating surfaces of the seal. 5) Seat the seal around the shaft, by carefully turning it on, sort of as if screwing it on the shaft until it seats cleanly all the way around. There should be no seal material protruding on the shaft. It is possible to roll a seal and ruin it if care is not taken here. 6) Using the crank bolt, a large washer, the seating pipe and a socket and ratchet start seating the seal. Check from time to time that the seal is going on evenly. 7) If the seal is going on evenly, finish seating it till it is flush with the bore or at the same depth as the original seal. Well, this certainly ended up being a lot easier than I thought it would be - and thanks to you because you posted this guide! You're welcome. Nice work and thanks for taking the time to post a comment. 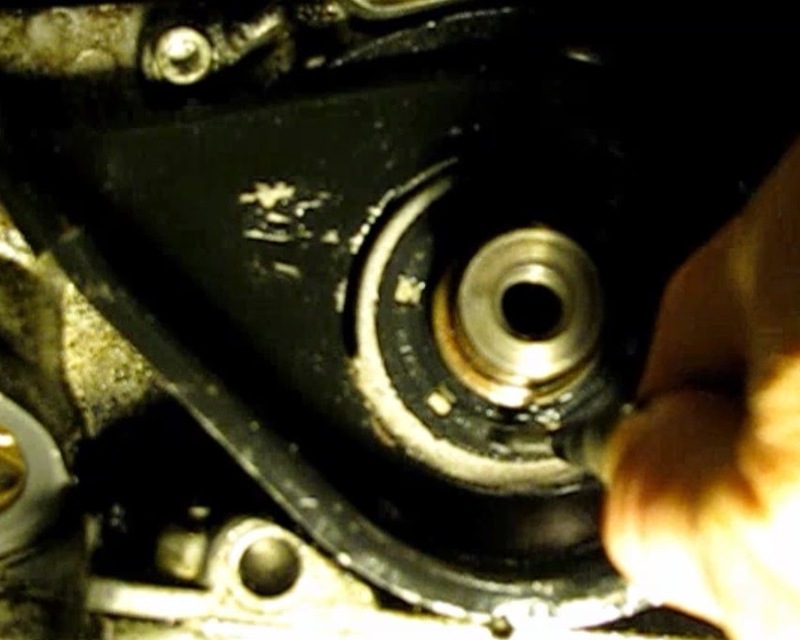 I found this blog really helpful on making me understand how to replace an oil seal in car. Actually my car is showing few troubles. When I talked to my service center and told them about the fault symptoms that I'm getting and they told me to check the oil seal. I could not understand how to do that but this article will definitely help me. Or else I'll visit my service center, Mercedes service Myrtle Beach SC to fix it. Anyways, thanks a lot. I'm glad you were able to make some use of this post. The only symptom I ever had from a bad oil seal is an serious oil leak. Good luck and thanks for looking at it and commenting. Thanks for this article. It seriously helped me to do some work for the company I work for! You're welcome. I'm glad you found this piece and were able to make use of it! Don't feel bad, I've been there too. Exacting work and not always right on the first try!